Ty Gwyn Cider01981 241181work BreweryTy Gwyn Cider are a craft cider company run by ex-musician Alex Culpin and his wife Laura. Expect a warm welcome at their cider shop and bar where they offer free tastings as well as selling snacks, t-shirts, gifts and local produce. They have plenty of seating inside and outdoors on a lovely sun deck, weather permitting! They produce both draft and bottled ciders. Their traditional draft ciders are naturally still, while their refreshing bottled ciders are lightly sparkling. All their cider is made from 100% juice and it enjoys a long fermentation period of not less than six months. Alex presses all the apples himself and makes his cider (and a perry!) in a cider shed adjoining the shop. Enthusiastic cider fans are welcome to take a look at the vats and the belt press and mill, one of only two of its type in the country! Their farm is in a fantastic location just above Pontrilas on the main A465 Hereford to Abergavenny road. Simply take the turning to Rowlestone and you’ll find them at the top of the hill. The farm has stunning 360 degree views and is excellently placed for walks in the nearby Black Mountains and Brecon Beacons. Alex and Laura will be happy to point you in the direction of all sorts of fantastic local attractions, and are also hoping to be able to offer accommodation on site in the near future. 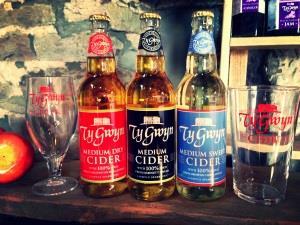 Ty Gwyn Cider are a craft cider company run by ex-musician Alex Culpin and his wife Laura. Expect a warm welcome at their cider shop and bar where they offer free tastings as well as selling snacks, t-shirts, gifts and local produce. They have plenty of seating inside and outdoors on a lovely sun deck, weather permitting! From A465 Hereford-Abergavenny, at Pontrilas take the road to Rowlestone. Continue up the hill for approx. 400m and Ty Gwyn Cider is the first farm on the left.